Why does Turkey need a new constitution and what makes it so difficult to draft one? Turkish PM Recep Erdogan gives a speech in Istanbul. Demotix/ Sadik Gulec. All rights reserved. In the run-up to the 2011 parliamentary elections, constitutional reform was Prime Minister Erdogan's top campaign promise. Given that for the last three decades Turkey has been governed under a junta constitution, the democratic merits of AKP's proposal could not be more obvious. The elections gave the AKP almost fifty percent of the popular vote and nearly two-thirds of the seats in the Parliament. This strengthened the Prime Minister’s mandate to begin constitutional talks with the opposition. However, the evolution of the constitutional debate over the last two years seems to have eroded the public's initial optimism. The parliamentary commission responsible for preparing the draft has not been able to reach substantive agreement on any of the major contested issues. If the parties do not manage to find a democratic solution to the deadlock, they risk making Turkey's political quandaries even more intractable. The dispute between AKP and the opposition is mainly centred on two groups of issues; political liberalisation (e.g., civil/political rights reforms) and the more institutional issues pertaining to the separation of powers. Among the proposals aimed at liberalising Turkish politics, those concerning definitions of citizenship and minority language rights are the most hotly contested. Some of these articles would redefine citizenship in more inclusive terms by removing ethno-nationalist references and creating more room for the use of minority languages in an official capacity, particularly in public education and courts. International media has already highlighted the democratic potential these proposals offer and the positive effects they have had on the talks with Kurdish rebels. The AKP leadership and Kurdish politicians represented in the Peace and Democracy Party (BDP) seem to have finally converged on the view that improving the rights situation and strengthening local governance structures represent the only viable solution to the decades-long violence. Ultimately, these reforms could bring the constitutional law in line with the country's multicultural reality. Opposition to the proposed rights improvements comes from different ends of Turkey's political spectrum. The centre-left CHP and the ultra-nationalist MHP – the two biggest opposition parties in Turkey – are both opposed to AKP's rights reform proposals. CHP's opposition is more to the letter of the law than to its liberal substance. For instance, on the issue of defining citizenship, the CHP MPs demand that references to Kemal Ataturk's revolutionary ideas, including the statist and anti-individualist ones, be kept in the new constitution. The ultra-nationalist MHP is more dismissive of the reformist agenda as a whole, and perceives the project of drafting a more inclusive constitution as a risk to the country's territorial integrity. 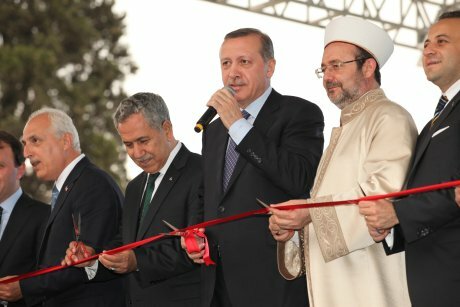 While these disputes are characteristic of the turbulent politics of liberalisation, what further complicates the Turkish case is the controversy surrounding the institutional reform proposals. Political tensions have further escalated in response to Prime Minister Erdogan's avowed interest in devising a new division of powers between the judiciary, legislature, and executive. Under AKP's plan, a separately elected president rather than prime minister dependent on the confidence of the Parliament would be responsible for running the state on a day-to-day basis. A powerful president, in the government's narrative, represents a democratic solution to the problem of political instability that will sooner or later return to Turkey. The underlying logic is that presidents can run their countries without being affected by the partisan bickering attributed to parliaments. Moreover, the winner-take-all nature of the post would eliminate the possibility of a coalition government – something that reminds Turkish citizens of the turbulent years preceding Erdogan's rise to power. AKP also plans to reshape the institutional structure and jurisdiction of Turkey's judiciary. The changes would centralise different quasi-independent higher courts under a Constitutional Court that will have a more limited power of judicial review. The most contentious element, however, has been AKP's suggestion that the empowered president should appoint nearly half of the justices without any oversight of the Parliament. The three opposition parties are more united in their criticism of this second group of proposals. They all hold that the proposed changes to the role of parliament and judiciary could push Turkey in a more authoritarian direction. BDP is the only opposition party that has stated, albeit in a reserved way, its willingness to discuss the government's plans to increase the powers of presidency. They have noted that the proposal could be acceptable to them in the framework of strong decentralization. Even some moderates within, or close to, the AKP are worried that the measures of institutional reform are, put mildly, unnecessarily adventurous and risk creating an even larger democratic shortfall than the one the new constitution aims to tackle. Opposition leaders claim that the constitutional crises have revealed the more authoritarian side of Prime Minister Erdogan. His opponents are rightly worried that AKP might be trying to package progressive measures necessary for improving Turkey's rights record with a few unrelated changes that are powerful enough not only to offset the rights improvements but also jeopardize the country's fragile democracy. Particularly concerning is the way the official narrative emphasizes political stability and overlooks the risks and failures associated with presidentialism. That Prime Minister and his advisors are either deliberately or inadvertently misleading the public, which is obvious from their inconsistent references to the concepts of political stability and separation of powers, and to the American experience. For instance, the masterminds of AKP's proposal draw on the stature of the United States as one of the most democratic countries in the world: If America is a functioning advanced democracy, how can a presidential system contribute to a democratic shortfall? But the reason why the United States has a presidential system is not to achieve more stability and efficiency than a parliamentary system has to offer. On the contrary, the Founding Fathers of the American Constitution were concerned about the parliamentary system producing too much political stability and paving the way for authoritarianism. The presidency would ensure an additional degree of government functionality in a system that already delivers a great degree of checks and balances. For instance, the United States is a country with heavily decentralised political institutions, multiple veto points, all designed to minimize the risks of a durable and effective majority will. Prime Minister Erdogan's hostility to effective opposition from other government branches indicates that his party's references to the American system are not well-founded. While the American case provides little support for importing the presidential system to Turkey, experiences of Turkey's neighbours offer important arguments against presidentialism. The stakeholders in Turkey's constitutional debate can learn a great deal from what countries such as Russia and Azerbaijan have gone through in the last twenty years. In these countries, powerful presidencies - and the ceremonial role of parliaments - have given incumbents and their parties a firm grip on electoral institutions, allowing them to effectively thwart political competition. Presidents' direct control - independent of parliamentary scrutiny - of executive offices responsible for such government functions as running elections and policing has proved quite damaging to democracy. Constitution drafting is not an easy exercise; and the Turkish case seems to be particularly difficult. Countries rarely find themselves in need of a new constitution, except in response to outstanding situations such as conquest, secession or regime change. Turkey's situation appears to be radically different. The country is going through a period of economic and political stability unprecedented in its past. This politicises the process more than one is used to seeing in other cases of constitution drafting. The challenge for the parties involved in this historic exercise is to be more concerned with creating a fair and democratic political framework than calculating how their decisions will play out in the upcoming elections. Despite the difficulties, a new constitution is a must. In the short run, status quo might appear favourable to risk-averse political parties worried about the Prime Minister emerging more strengthened out of this process, but the political-social dynamics of Turkey – its civil rights shortfall and the ever-present risk of political violence – make constitutional reform necessary. Moreover, this period of political stability and economic success could be more suitable for getting rid of the existing constitution's restrictive provisions that resemble martial law. Given that the stakes are high, the journey towards a new constitution will be a difficult one; but here are a few suggestions that can make the process more tolerable, and the outcome more palatable. Whether he is merely interested in amassing more power for himself and his allies or truly in creating a stronger, more stable Turkey, Prime Minister Erdogan has to act with a higher sense of responsibility. Any reform in the Turkish system has to begin from an appreciation of existing minimal democracy, which by the neighbourhood standards is actually quite advanced and praiseworthy. This requires strengthening, not undermining the institutional basis of competitive electoralism. The proposed shift from a parliamentary to a presidential system will introduce an element of winner-takes-all in a region with no experience of the measures that can alleviate its ill effects - strong individualism, scepticism of authority, and multi-leveled governance. Even if the Prime Minister needs a more strengthened presidential office to push his alleged hidden (Islamist) agenda farther, he should think twice before he creates the monster. Powerful institutions are rarely conducive to stability – they can easily be hijacked, and used to persecute predecessors. There are also positive steps that the opposition parties have to take if Turkey is to adopt a constitution more conducive to democracy than its current one. For instance, if the CHP continues to limit itself to doing only half of what democratic oppositions should do in difficult times (and not fulfill the more constructive duties that come with the status of the official opposition) they will ultimately have to share the blame for the failures of the process with the government. So far in the process, the centre-left CHP has stood side by side with the ethno-nationalist MHP in vilifying the fourth party BDP's Kurdish politicians who have been making the case for more cultural and political rights in the new constitution. History, relations with the army, and the fear of an inner-party clash has inclined the party to defend the junta constitution's Kemalist vocabulary, and insist that archaic references to the sanctity of the state and Turkishness be carried on to the new constitution, rather than making the much needed social democratic argument. It appears that what mainstream parties including the CHP have for decades branded as the destabilizing threat to Turkey's fragile democracy -- a Kurdish political party -- can end up saving it. The BDP is not only a legitimate voice to reckon with, but also has evolved into a potential ally in democratic opposition to an increasingly powerful Prime Minister. A little more pragmatism from CHP and BDP could make the democratic scenario work. First, to keep the parliamentary commission functioning, CHP needs to stop demonising BDP's Kurdish MPs. In their turn, BDP politicians can make this collaboration feasible by being more attentive to the sections on the separation of powers. By debunking CHP's claim that "the Kurdish Party" is merely after winning concessions for Kurds, BDP could make it easier for the CHP leadership to convince their base of the merits of a more democratic constitution. Alternatively, BDP could bypass CHP and make a deal with the Prime Minister; and CHP could move closer to the ultranationalists with the aim of defeating the proposal in the referendum. Such a gamble would not only destroy one of the two sides, but also wreak havoc the political playing field. Thus, at this critical juncture, the need for responsible opposition is as important as responsible governance. How the BDP and CHP deal with each will affect the fate of the new constitution in no less serious way than the posture of the AKP government.